This was not a super great week for me. I mean, I had a few good runs, but no cross training at all. I even actively thought, hey, I’m not going to run this day, I can/should go to the gym! Did? Nope. So, I’m a little disappointed in myself over that. I will try better next week. I will probably not make much of, if any, effort to pick up anymore overtime shifts next week beyond the one I’m working next Saturday, so I will have NO excuse to not hit the gym at least once. I have a super early doctor’s appointment for pre-annual physical blood to be drawn on Monday, but I’ll be able to go for a run immediately after that. In fact, might go run around the downtown lake on the hike/bike trail. 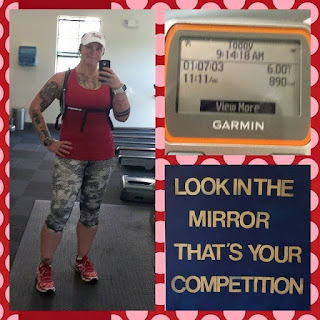 Then, Wednesday, right before work, I have my rower test for work to do, so I won’t be working out that morning at all because I want to do my best on the rower that I can. I *will* be wearing my heart rate monitor for the test and counting it as a “workout” for that day. 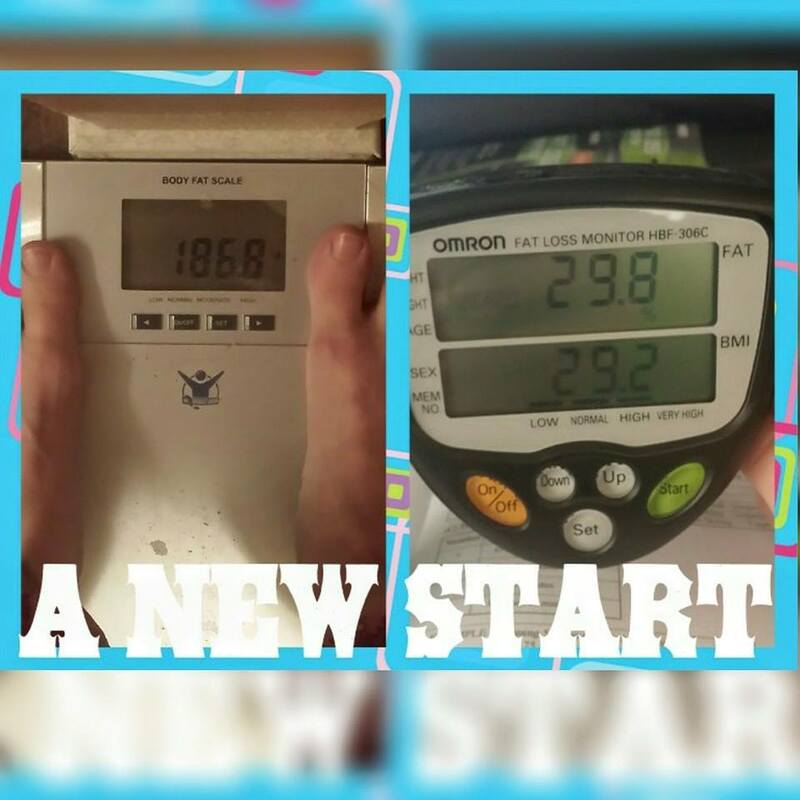 I got my Omron Fat Loss Monitor in the mail yesterday, so of course I read the instructions and set it up and used it today when I got up (I worked the night shift last night, so I was sleeping until 2:30pm). I wasn't as shocked as I thought I would be at what it says my body fat % is at. The BMI is about where I thought it would be. Also, I decided to step on the scale and see where that was at and was surprised that I hadn't gained more weight since I last got on the scale a couple weeks ago. 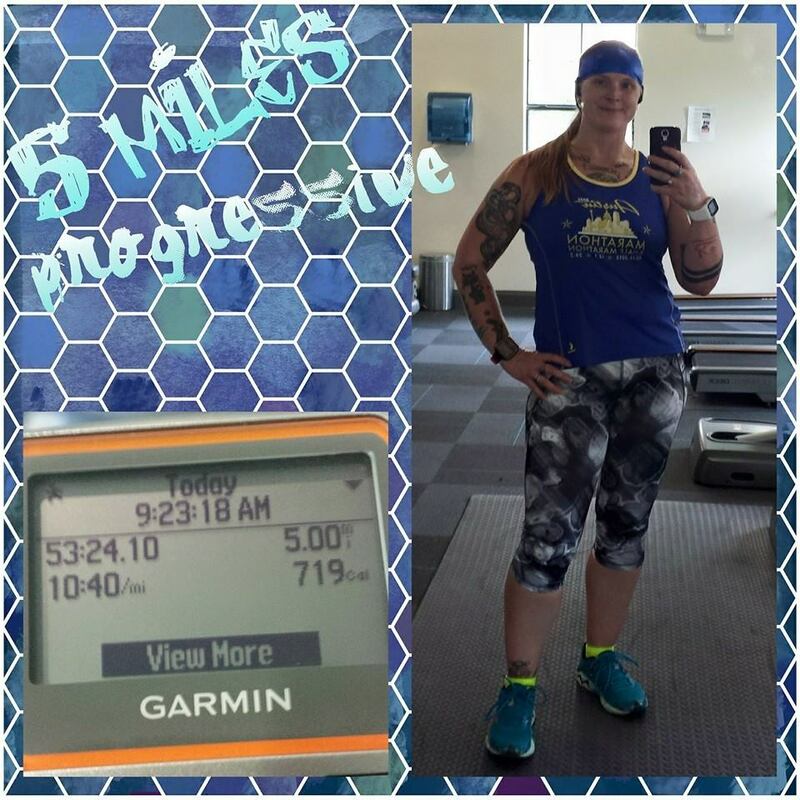 • Saturday: ran 5 miles. If I remember correctly, I had set out to do 4 miles, but decided at like the 3 mile mark that I wanted to do 5. This run was also a completely progressive run…each mile faster than the previous one…even if only by a few seconds. • Sunday: was originally going to run 13.1 miles, but changed that to 10 miles Saturday evening. When I got up Sunday morning later than I had meant to, I decided I would just do 8. I went to my hilly route for this run. It was a good run, but I was done at the end of the 8 miles, so I’m glad I changed to just 8. If I had gotten up and started running an hour earlier I would have definitely done 10. It was starting to get pretty warm by the time I got done. • Monday: took this as an on purpose, pre-planned rest day. However, this is one of the days where I was all like, I’m not going for a run and I have plenty of time, I should go to the gym, and then I didn’t. • Tuesday: ran 6 miles this day. It was a good run, but again, I procrastinated too much and by the time I got done, it had started getting pretty warm out and so I was completely spent at the end of my run. In fact, spent the final ½ mile praying for it to be 6 miles already so I could stop. • Wednesday: this was National Running Day!!! I had 10 miles planned (on my hilly route even! ), however, Tuesday, the morning supervisor asked if I could work for her this day. As much as I really wanted to celebrate NRD with a good run, I’m not turning down extra money on my paycheck. 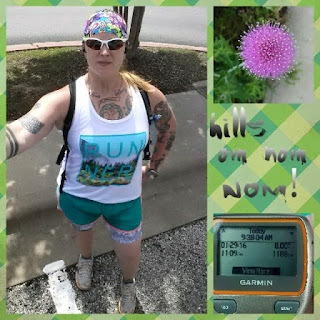 • Thursday: was going to run my NRD 10 miles, but was tired from working 16 hours yesterday, so slept in and ran some errands before work instead. (also, is it just me or do you get all giggly when I type the initials for National Running Day? NRD…get it? NRD = nerd! Hahaha!) This was also a day that, since I had decided I wasn’t going to run, but still had plenty of time to go to the gym…thought about it, but then didn’t act on it. • Friday: I was going to run. In fact, I got up and put my hair in a ponytail in prep to run. Then I decided to see if I could get Garmin’s latest suggestion on how to get my watch to sync with their website to work. That took longer than I thought it would because, well…because it worked. All but one run synced. My Portland RNR data didn’t sync. That makes me a little sad, but maybe it will sync at a later date and then I can delete the manual entry I made. Anyway, by the time I got done syncing everything, there was still more than enough time to run, however it’s June in Texas which means it is now the season of Hades here, so it was too warm for anything more than 3 miles and I wanted to do at least 7. 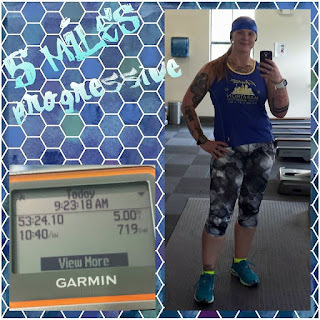 A little disappointed because if I had known ahead of time it was National Donut Day, I would have not bothered with the Garmin syncing at this time, would have slipped on my donut leggings and gone for my run! I have plans to make up this run today because I was feeling all sorts of emotional yesterday and I’m guessing it’s because I haven’t run since Tuesday. Something that made a difference this week for me was that I went on Thursday (one of my errands) to a running store in Round Rock called Fleet Feet. I went there looking for a toe spacer to help with my developing bunion and hoping that it won’t get worse. Well, they don’t sell toe spacers, but the lady was super awesome and googled for local places that would sell them. She came up with a Podiatrist office in Bee Cave. So I left early for work and went there. They indeed sold them and they were $14. They said that it was a very durable spacer. It slips over the big toe and has a larger piece of “rubber” that holds the big toe in place and then there is a layer of the “rubber” that lays over the outside of the joint where the bunion develops to help reduce or completely eliminate friction on the joint. I put it on when I got to work and within just hours after starting my shift, the discomfort I had been feeling in that joint was basically completely gone. The spacer part that goes between the toes is soft and, even though I had thought it would be annoying to start with and that it would take a while to get used to it being there between my toes, I barely notice its presence. While I was at the podiatrist, I made sure that they take my insurance…just in case the bunion does get worse and I need actual treatment. They do! I was hoping to give it a test RUN with yesterday’s run, but since I didn’t run, it will have to wait until I do go for a run to see how it works out when running. As I’m sure you’re fully aware, the last day of May was Sunday. I totaled up my mileage for May. 101.9 miles. However, I am sad to report that those are not 100% running miles. There was a 9.25 mile technical hike and a 5.25 mile walk around town that I added in so I could hit at least 100 miles for the month so I satisfactorily met the challenge I set out for myself. Speaking of that challenge, the company I’ve been buying the 100 mile challenge belt buckles from each month changed the design starting this month (June). I don’t like it. So, I won’t be buying buckles from them anymore which means I can also kiss goodbye buying the buckle for January this year when next January rolls around. Unless of course they go back to the previous design. 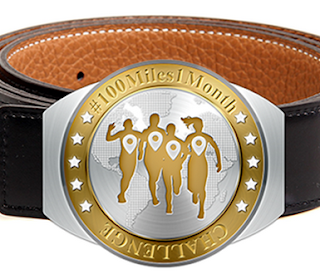 I am going to do a search and see if I can’t find another company that does a 100 miles in a month challenge and releases buckles specific to each month…or medals…and switch to theirs if I like it better. Otherwise, I guess I’ll just pick a virtual race each month to do…which will actually be cheaper than the 100 mile challenge buckle was. The buckle was $39.95 after shipping. Virtual races are usually $30 or less, even with shipping. And like 95% of all virtual races have some portion of their profits goes to a charity. 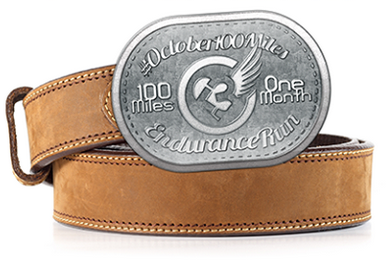 As far as I know, none of the profits from the buckle went to any charity beyond beefing up my bling collection. A lesson learned this week…get up earlier to run! It’s starting to warm up down here in Texas, so that means if I want to not get fatigued from running in the heat and avoid heat injuries, I NEED to get up and out the door earlier in the mornings for my runs. This whole waiting until 9am just isn’t going to cut it anymore. Last summer, I would wake up around 5:30-6:00am, go run, shower and then go back to sleep until it was time to get up and get ready for work (another hour or 2 usually). That worked great for me once I got used to doing it. Now, I need to get myself used to doing that again. I had a race that started at 8 this morning and it was my first really hot and humid run. Even when I've run after work lately, it hasn't been too hot and it hasn't been humid at all, but 8 a.m. seems to be the worst of both worlds. The sun was oppressive, which actually helped me take it easy, which actually led to a negative split, even though it was uphill on the way back, so not all bad! yea, i've got a race next month but it starts at 6:30. it's bound to be humid at that time, but yea, 8 is the "best" of both the hot and humid worlds. that's why for my summer running, i get up before the sun and run that way i just have the humidity to deal with.